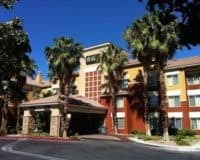 The Travelodge Las Vegas Airport North, 5075 Koval Lane, combines a convenient location, with good service and a competitive price. The Travelodge Las Vegas Airport North/Near the Strip lies in between the McCarran International Airport and the world-famous Las Vegas Strip. 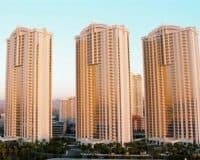 This makes it an excellent choice for those visiting town on business, who need to get in and out quickly, while still wanting access to the magic that Las Vegas has to offer. The hotel offers a reasonable range of amenities, including a refreshing outdoor pool, perfect to cool off in during the hot Nevada summers. 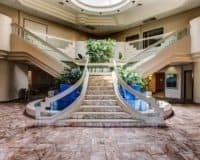 Along with the usual things that you would expect, like free parking for those who bring their own vehicle and easily accessible WIFI that can be found throughout the property. The hotel also offers guests the chance to start their day the right way, with a free buffet-style continental breakfast. Along with a free shuttle service that goes to and from the McCarran International Airport, ensuring that you don’t have to worry about booking a taxi. The rooms are simple, while still providing everything that you need, including comfortable beds and clean bathrooms. Along with their own television, equipped with cable, a safety deposit box that ensures all your belongings remain safe and tea and coffee making equipment in every room. 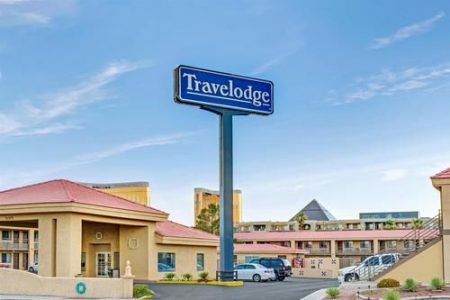 The Travelodge Las Vegas Airport North is a great choice for anyone traveling to Las Vegas on business, combining a convenient location, with good service and a competitive price to ensure that you have a comfortable and productive stay. The great thing about chains like Travelodge is that they consistently deliver what you want and don’t provide any surprises, with this one being no different. 1.2 mi (1.9 km) from Crystals at City Center. Within 3 mi (5 km) of University of Nevada-Las Vegas and Las Vegas Convention Center. Within 3 mi (5 km) of the Thomas and Mack Center and Fashion Show Mall.